YOUR DINNER SUIT, YOUR WAY! With a fine line between fancy and fancy-dress, we’d like to offer up some do’s and don’ts when it comes to choosing your Dinner Suit. 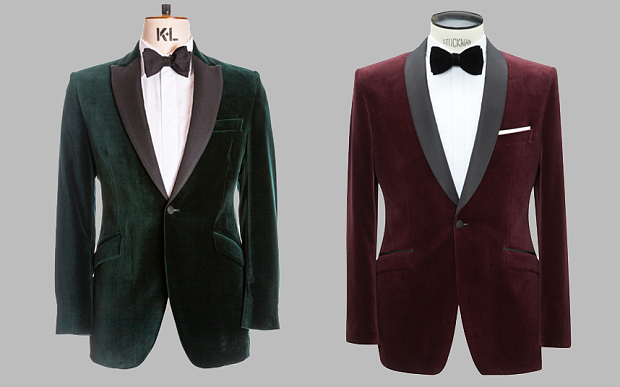 Black Tie no longer means black is your only suit colour option. I recently went to an open air rock concert, attended by rich and famous and mere mortals like me, the dress code was black tie and I pretty much saw every take on this classic theme. Whilst I encourage individuality and expressing yourself the fine line of good taste was crossed far too many times, Eddy Jordan please call us you need our help! We will try to guide you through some colours, fabrics, texture and patterns! OK, so you only wear a dinner suit a handful of times a year but do you really want to turn up in a not great fitting hire suit and look very average? 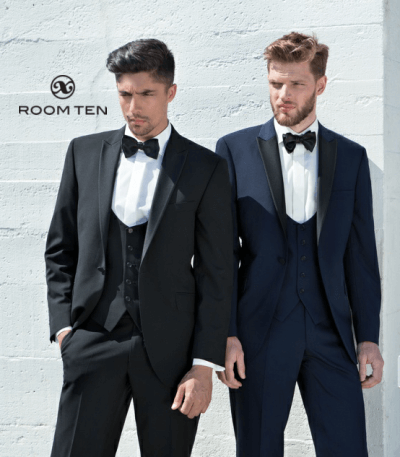 Invest in a well-made roomten dinner suit that fits you properly, using great fabrics you’ll always look good”. With a dinner jacket, it’s the small details that make the difference: the facing material on the lapels should match the braiding on the trousers and ideally the button fabric.Grosgrain silk, rather than satin, looks more considered and elegant. “The fabric is important because it’s got to last; traditionally it’ll be wool barathea, medium to heavy weight or you can go for mohair – at roomten we’ve introduced a wool and mohair mix. The beauty of mohair is it plays on the light – you get a luminescence you don’t get from wool. Throwing back to the glory days of Forties Hollywood, a double-breasted jacket comes with four to six silk-covered buttons instead of the regular one or two. In line with the rise of the DB suit in recent seasons we’ve seen the return of the DB dinner jacket (in both black and off-white). The one golden rule? Keep the top button fastened and the bottom unfastened at all times when standing up. For evening-wear aficionados looking for something a little bolder, try out a patterned dinner suit. This could be a full on tartan or check style fabric however we have some much more subtle options for you to consider from two of our favorite mills, Ariston and Holland & Sherry. Whether you use a patterned fabric just for the jacket or for the whole suit will depend largely on the design, we will help and advise accordingly. Just remember to limit all your accessories to straightforward black and white to make the jacket stand out for all the right reasons. 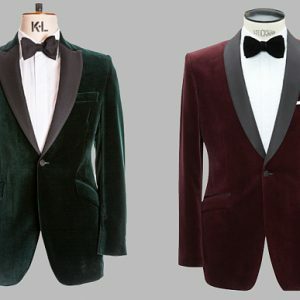 Another style we’ve seen re-emerge on red carpets over the past two or three seasons is the rebirth of the three-piece evening suit. Adding a matching waistcoat into the mix makes this quite possibly the most gentlemanly black tie option out there, we recommend a 4 button low scooped waistcoat design which will be seen when the jacket is undone only. The other benefit of wearing a waistcoat with your dinner suit is it replaces the need for a cummerbund.